View the frequently asked questions and answers, providing information on a variety of topics relating to ConFest. The following links each link to their related topic and information included throughout this FAQ. To view the related information, simply select the link and topic or scroll down the page. When is ConFest and when can I arrive and leave? How much does it cost and where can I purchase tickets? How can I volunteer and get involved? Why are all adults asked to volunteer for 2 hours as part of their ticket? What do I do if I have a problem /emergency at ConFest? Can I bring pets to ConFest? Are there toilets and showers at ConFest? What do I do with my rubbish at ConFest? Can I bring my car into ConFest? Can I take photos or record at ConFest? Can I drive my vehicle at night? What happens if I arrive at night? Can I purchase food, drinks and ice at ConFest or do I cook myself? What are the fire restrictions at ConFest? What / when is a Working Bee? What dates are the ConFest Committee and DTE (Down to Earth) Director Meetings held on? Where are the ConFest Committee and DTE Director Meetings located? What is the postal address / PO Box of DTE? Are there online forums for ConFest that I can view and post in? I noticed an error on the website—where can I report this? ConFest is a non-profit volunteer run event, focused on bringing a range of people and alternative cultures together. Together, people enjoy themselves, teach each other, host workshops, play music, dance, discuss ideas, make new friends, enjoy fine food and much more. ConFest is more than a festival—it is a way for people to discuss, develop, express and implement ideas in a safe and comfortable environment. The workshops and conferencing focus not only on teaching people new skills but finding solutions to problems that people and the world face. The about page contains more information about ConFest, such as information about the music, arts, workshops and location to name a few. Read more on the next ConFest page to find out more. Please view the tickets page for information on the cost of tickets and purchasing tickets. The current site is approximately 14 km from Moulamein, NSW on the Moulamein-Denniliquin Road. View more information about the location and map. The Down to Earth Co-Operative Society has been organising ConFest since 1979, it is an entirely volunteer and not for personal profit organisation. Down to Earth volunteers create the space and necessary amenities for ConFest to happen. The rest of it is created by all ConFesters. As the event is entirely run by volunteers, each adult attending is asked to contribute two hours to ConFest as part of their ticket; eg. assisting the Info or First Aid tent, greeting people at the Welcome Gate, etc. There are a variety of ways you can get involved and volunteer at and with ConFest. During the festival, you can volunteer for various tasks such as set up, pack down, rubbish clean up and many other areas. Before and after the festival, you can volunteer and get involved by attending the working bees on the ConFest grounds, attending the meetings, sign workshops, and various other areas. As part of the adult ticket cost, all adults are asked to contribute and volunteer for 2 hours and help out around ConFest. To find out more information, please visit the get involved web page. As part of the adult ticket cost, you are asked to contribute and volunteer 2 hours of your time to help around ConFest. ConFest is a not for profit event based on participants contributions, community ideals, communication, volunteering and expression. Your involvement helps the gathering run successfully and smoothly, while creating an active community. ConFest would not run if it were not for the fantastic people that help out, whether for 2 hours or more. No matter how much you help out, every bit of effort is greatly appreciated. The contributions also greatly assist in keeping ticket costs down for the festival, allowing many people to attend, no matter their financial position. You can easily contribute through a variety of ways, as listed above in the section how can I volunteer and get involved. There are a variety of camping areas at ConFest. These include areas where noise can be expected along with many people enjoying themselves well into the night, and areas that are far more quiet for peaceful camping and a good night's sleep. When camping, remember to take into consideration the type of area you would like to camp and sleep in. Additionally, for those looking to avoid the noise, a pair of earplugs / noise cancelling earplugs can come in incredibly handy. What do I do if I have a problem / emergency at ConFest? For medical issues please go to First Aid, amongst the volunteers there are doctors, nurses and those with first aid certificates among many other skills. They also have the facilities to contact an ambulance if required. For security and other problems including, lost property, misplaced friends and relatives please contact a volunteer in the information area. For fire issues, ie illegal use of personal cookers, candles and other fire etc, please give the information and location to a volunteer at the information area. For fire emergencies please firstly attend to the saftey of you and the people around you making sure that all era aware of the fire, then attempt to put it out if it is safe to do so as well as sending someone to report the fire and location to a volunteer or to the information area. For other issues please ask a volunteer at the information area if they can help, and please remember that all ConFest volunteers are giving you the gift of their time and effort, and will do all possible and reasonable to assist in the given circumstances. Only if you have an Assistant Animal for sight issues or other reasons, if this is the case please contact firstaid (at) confest.org.au for further information. For the health and safety of the animal, ConFesters and the local wildlife no other pets are allowed on site, Unauthorised animals may be removed to the local animal shelter or pound. Yes, there are well constructed toilets around the site, volunteers work hard to ensure they comply with all regulations. These are intended for human waste only. Please do not put your rubbish in the toilets as it can block the systems. Whenever camping, it can also be handy to bring along your own toilet paper just in case. There are also outdoor cold water showers set up around site, often in trees. The water can at times be warm to hot depending on how much sunlight there is. Additionally some spaces may set up heated outdoor showers. There is no rubbish collection service at ConFest. Please minimise the packaging you bring. Remove things from their cartons, pool your money and buy in bulk. Avoid bringing glass and do all possible to take all your rubbish with you when you leave, disposing of it responsibly on your way or at home. Please do not leave your rubbish in the 44 gallon drums around site that are intended to contain water for fire safety at the communal kitchen spaces or in the market. The gathering focuses on a 'leave no trace' principle with rubbish. Please take all your rubbish with you as you leave the event. You can also volunteer with picking up rubbish around the site, which contributes to your two hours of volunteer time or whatever the total you are aiming for may be. To volunteer for rubbish clean up, please enquire at the info tent where you can pick up rubbish bags and learn more about the role. No cars will be able to access our lush forest past the series of locked boom gates along the forest tree line. You will need to park and use the shuttle bus. It is well worth it the effort to get into the shady cool forest by the river. There are many ConFesters who for good reasons do not wish to be photographed, please be respectful of this and seek permission to take someone's photo, including all identifiable participants in the photo. Please remember that there are some areas at ConFest where it may not be appropriate to take a photo of someone. Please respect the privacy of all attendees at the gathering. Photographs, video and audio recordings are sometimes taken at ConFest for creative purposes and simply to document our celebrations; our "history as it happens". This should always be announced and permission sought beforehand to allow those not wishing to participate to avoid the recording device or leave the area. Due to safety reasons, vehicles are restricted from moving around the site grounds at night. Vehicles can only move around the site grounds during daylight. If you arrive at night, you will be asked to park your vehicle at the front gate. Vehicles are restricted from moving around the site grounds during night time due to safety reasons. You may be able to walk into the site grounds. Arriving during daylight will allow you to drive around certain areas of the site and enable you to set up your camp easier. In the market area, there are a range of different stalls offering various types of food and beverages, along with vegan, gluten free and dairy free meal options. 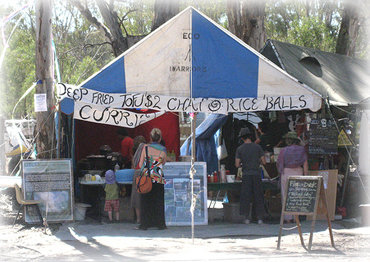 No alcohol is served by the market stalls; BYO only, no glass allowed. The ice truck will also drive around two times a day, selling ice to attendees. Remember to bring your own cutlery, utensils, bowls, cups and so forth for convenience and to help reduce packaging waste. **Also there are our Cooking Circles where you can cook up your own feasts. There are strict conditions imposed on the use of fire for participant safety and legal conditions. 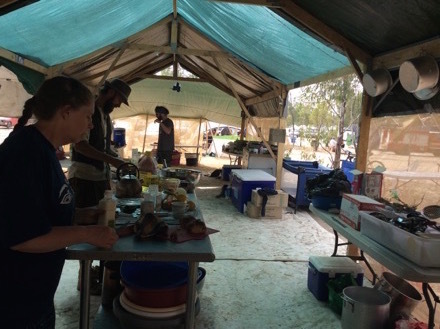 Gas and fuel cookers can only be used in the prepared and sanded communal cooking circles provided, and only when the local fire restrictions allow. These fire restrictions vary depending on the time of year, whether Summer ConFest or Autumn ConFest. Please read up on the fire information and restrictions here. Telstra and Optus access at Moulamein is 3G. Internet coverage is slow however is possible. The network may be prone to saturation. A high number of connections to these towers may slow the internet down to the extent that it is difficult to perform web based tasks. There is 3G reception to phone call and sms quality in Moulamein. Patchy call and sms coverage extends along Pretty Pine Road to the site. Gate number 1 has 3G coverage however connections may not hold and it may be too slow to complete web based tasks - especially if network saturation occurs. Telstra and Optus 3G access extends towards Deni along Pretty Pine Road, however there is a black hole that runs in a stretch along Pretty Pine Road to Deni. Deni has Optus and Telstra towers. As far as driving routes go, the Moulamein route (rather than the Deni router) has more consistent coverage to the actual site itself. 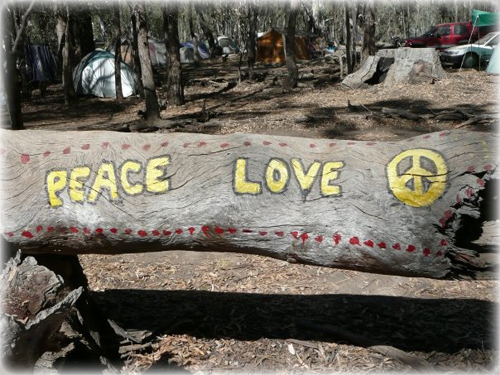 A ConFest Working Bee is an event where volunteers attend the site grounds and work at enhancing areas, fixing up anything that requires it, protecting Aboriginal sacred sites, preserving the environment, building infrastructure, along with discussing and developing solutions. There's also some fun thrown in, because all work and no play makes Jack a dull boy. The working bee is organised as the site grounds, infrastructure and equipment require maintenance from time to time. The working bee also provides a fantastic opportunity for people to implement their ideas and help ConFest develop. The next working bee will be held in the September school holidays from Monday 22/09/2014 to 11am Thursday 2/10/2014. To view more information and register for the working bee, please select this link. What dates are the ConFest Committee and DTE Director Meetings held on? You can view the dates of the upcoming ConFest Committee and DTE Director Meetings on the Meeting Dates page. These meetings discuss the running and organisation of various parts of ConFest. The meetings are held at the Education Centre off Lee St at the CERES Community Environment Park in East Brunswick VIC 3057. You can also view the location on Google Maps. When reporting an error, please include as many details as possible such as the process for the error to occur, where exactly it is located, along with the web browser and version of the web browser you are using. Before reporting an error, please check that it is not caused by use of an outdated web browser or browser addons that are interfering. In some cases, the errors may be caused by use of an outdated web browser that is not compatible with all the features this website includes. It is recommended to keep your web browser updated, though also remember to check that all addons, software and features you use are compatible with modern versions of web browsers before updating. A good web browser to use is Mozilla Firefox; it is free and the most recent versions include great features and security. Users modifying their browser and software do so at their own risk. Remember to create a backup or restore point before any major changes to your device. Questions posted in the forum may also be added to the FAQ, depending on how frequently they are posted and how important the relevant information is. ConFest is one of the best family gatherings there is. There are workshops, villages and just good old fashion mud.